This is the 5th and FINAL Documentary produced by David Carter and sponsored by local Sanibel Broker Eric Pfeifer. The latest documentary created by seven-time Emmy Award winner David E. Carter, Postcards & Photos from Sanibel: The Sequel, will premiere at The Community House on Tuesday, January 30 at 7 p.m. The film will feature more than 60 historic photographs from the Charlie McCullough collection. Carter’s new documentary is a feature- length film done “Ken Burns style,” with narrators reading “postcards and photos from Sanibel” with a storyline that follows life on Sanibel from 1946 through 1984. Photographs and postcards from Sanibel are the foundation of the piece. According to Carter, a large majority of the images in the library collection featured photographs of Sanibel prior to the construction of the causeway, which opened on May 26, 1963. More recent images were scarce. That is, until members of the McCullough family stepped forward and offered the filmmaker total access to the Charlie McCullough collection, many of which were taken between the late 1960s and early 1980s. The original documentary, which premiered in early 2017, covered the years 1884 – when the Sanibel Lighthouse was built – through 1947. The new film picks up in 1946, to provide a transition between the two stories, and ends in 1984, the 100th anniversary of the lighthouse. 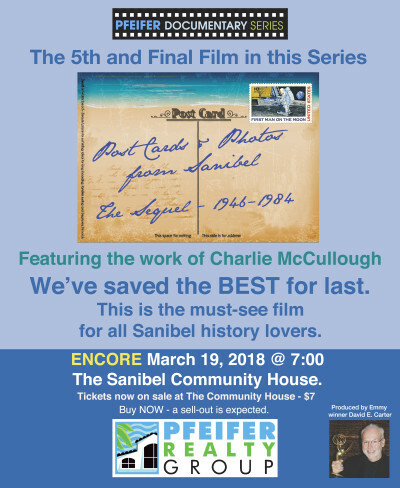 Postcards & Photos from Sanibel: The Sequel is the fifth film in the Pfeifer Documentary Series. Proceeds from the film screenings, DVD sales and related activities have produced more than $30,000 for island non- profit organizations. Tickets to the January 30 premiere are $7 each, on sale now at The Community House, located at 2173 Periwinkle Way. For more information, call 239-472-2155. Each film has facilitated donations to local Island Non-Profit organizations and to date have generated over $30,000.